We’ve come to the last installment of our Summer Grill Out Series. If you missed the first two, head on over to check out this Italian Bean Dip and this Grilled Romaine salad. For this last installment, I’ve decided on a rich and flavorful main dish that is the perfect summer entertaining meal. Where do I even start with the things I love about this meal?!?! I love the heat of the steak fresh off the grill paired with the chilled quinoa. 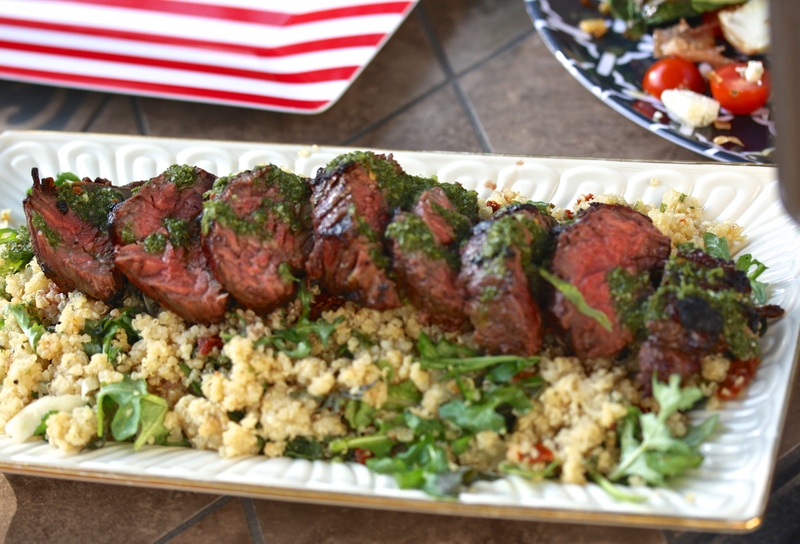 I love how the richness of the meat is complimented by the herbaceousness of the chimichurri sauce. And, perhaps most of all, I love that the bulk of this meal can be made ahead of time, giving me a chance to actually enjoy my company and a glass of wine. The salad and sauce can be made ahead of time (actually, the salad is even better the next day) and the meat can be in the marinade for 24 hours so you simply throw it on the grill and assemble everything together. See, I told you…the perfect meal for entertaining! Combine all ingredients for the marinade in a plastic bag and marinade steak for at least 8 hours or overnight. For the Chimichurri sauce, place all ingredients in a food processor and blend until smooth. This can be done a day in advance. For the salad, add the scallions, basil, fennel, sundried tomatoes and lemon juice to the quinoa while it is still warm. Pour dressing over the salad and toss to coat. Place salad in the refrigerator until chilled. Before serving, add arugula and toss to combine. Grill steak for 7 minutes on each side, or until done to your liking. 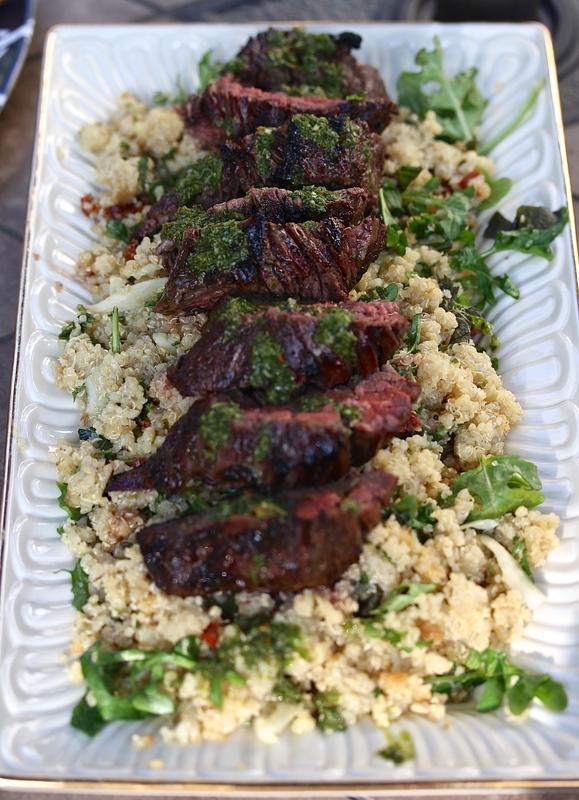 Slice and serve over the quinoa and drizzle with Chimichurri sauce. 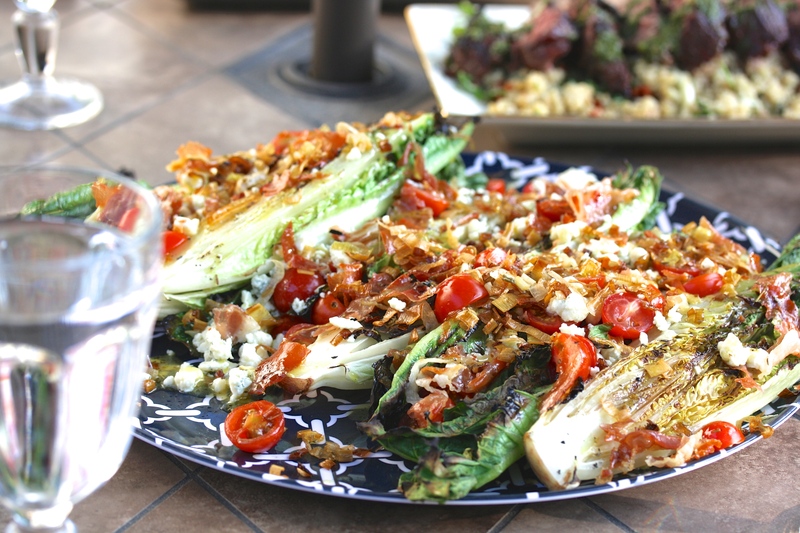 This salad is really the inspiration behind this whole meal in my Summer Grill Out Series. We have a local restaurant that serves a salad very similar to this and I get it every single time I go, which says a lot since I usually prefer to vary up my menu selections. The concept of grilling your salad is a complete game changer because it adds a smoky charred flavor that makes it something special. 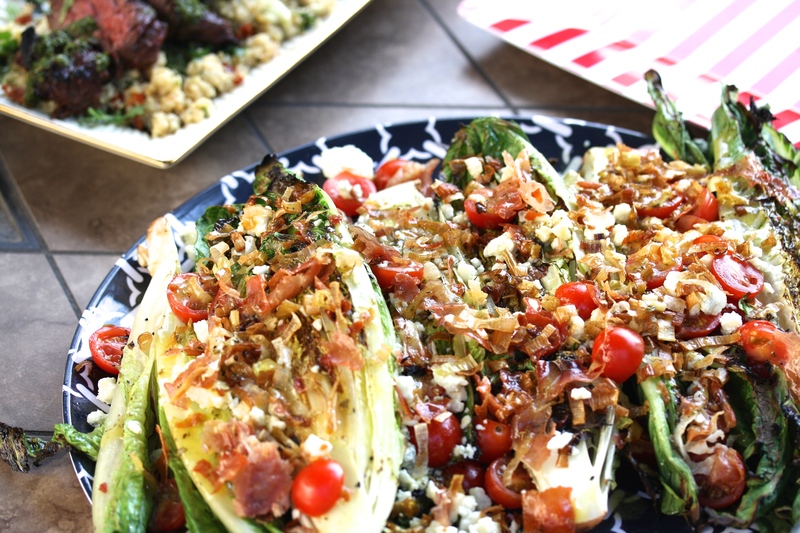 This particular salad also comes loaded with fried leeks and crispy prosciutto, which pack a pretty hefty punch in the flavor department themselves. While this salad requires a bit more effort than your regular old garden variety salad (shameless pun), I can assure you it is totally worth it. And, may I suggest making extra leeks and prosciutto so you can enjoy the deliciousness multiple nights in a row. In the case of this salad, there is no such thing as too much of a good thing. Preheat oven to 400 degrees. Lay prosciutto out on a baking sheet and bake until it begins to shrivel around the edges and get crispy (about 10-15 min). Meanwhile, fill a pan with about 1 inch of frying oil (I like grape seed) until oil looks shiny and ripples across the top. You can test the readiness by dropping a few leeks into the oil. Once the oil is ready, fry the leeks in small batches for just about a minute and fish out with a slotted spoon. Place the fried leeks on a paper towel to absorb excess grease. Thoroughly mix all ingredients of the vinaigrette and set aside. Brush romaine halves with oil and place on a hot grill for 2-3 minutes or until slightly charred. Serve while still warm, topped with leeks, tomatoes, cheese and prosciutto. Drizzle with the vinaigrette and enjoy. We ended up going with the Bright Eyed and Bushy Tailed Nursery Bedding from Land of Nod. I liked the mix of prints they incorporated into the pattern and thought I could easily add my own elements where I wanted. 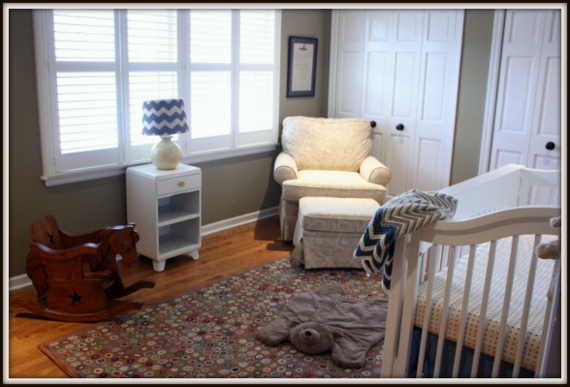 And, how cute is that little bear play mat on the rug?!?! A good friend picked it up for me at Pottery Barn Kids and I’m obsessed with how soft it is. I asked my friend, Rachel, if she would paint something for the nursery because she is ridiculously talented, especially with children’s themed art. I had something specific in mind, but she asked if she could take some creative license and I could not be more pleased with what she came up with. I love the bright colors contrasted with the white shadow outlines. I keep telling her she needs to start an Etsy store (hint, hint). This next item is one of my all time favorite organizational tools for baby. My mother-in-law actually made me one when I had my first daughter and once we found out we were having a boy, I begged her to make me another one. 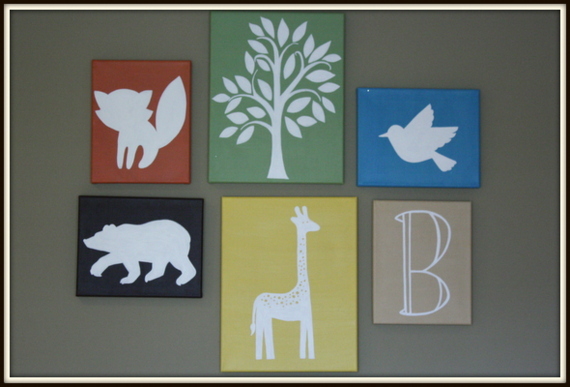 Since we don’t have a changing table, this wall hanging is perfect for housing everything from diapers to ointments to medicine. 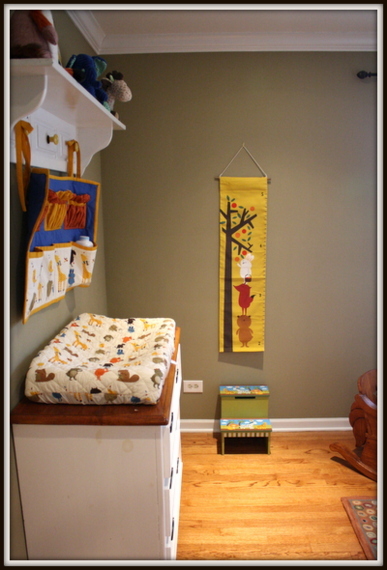 We have it hanging right above the changing pad so everything is easily accessible. I took on a little project of my own once we found out we were pregnant. One of my friends introduced me to the Purl Bee blog which is loaded with fun crochet and knitting patterns. 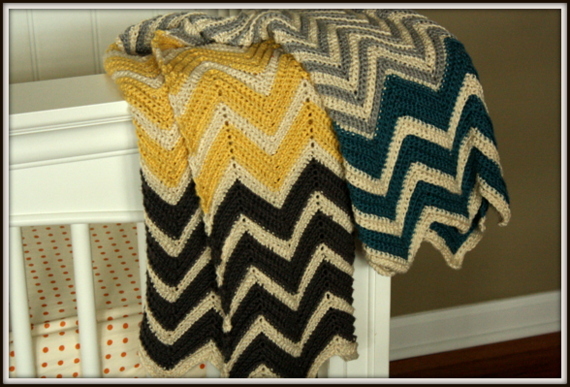 I found this adorable chevron baby blanket and used a soft cotton blend instead of the suggested merino wool. I also adapted the pattern for crochet since I find crocheting easier. 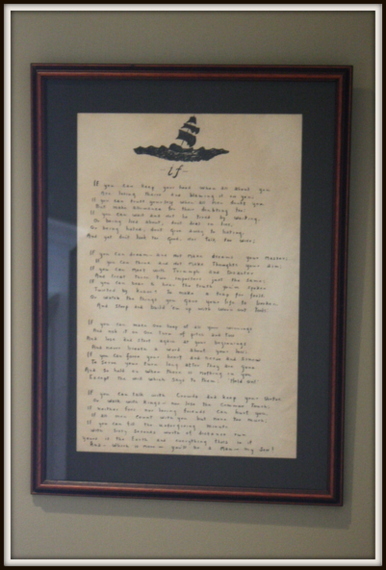 Last, but certainly not least, is this beautiful poem, “If,” written by Rudyard Kipling and penned by my great grandmother. It hung in my brother’s room for many years, but my parents passed it along to me to hang in their first grandson’s room. We are ready for you anytime, little man! Now, I know what some of you might be thinking. Pudding is hard to make. It’s finicky and time consuming. Well, I can assure you that this recipe will change how your view homemade pudding because it is so stinkin’ easy. It comes together with almost no cooking time and yet still has that smooth thick texture of the chocolate pudding that you know and love. 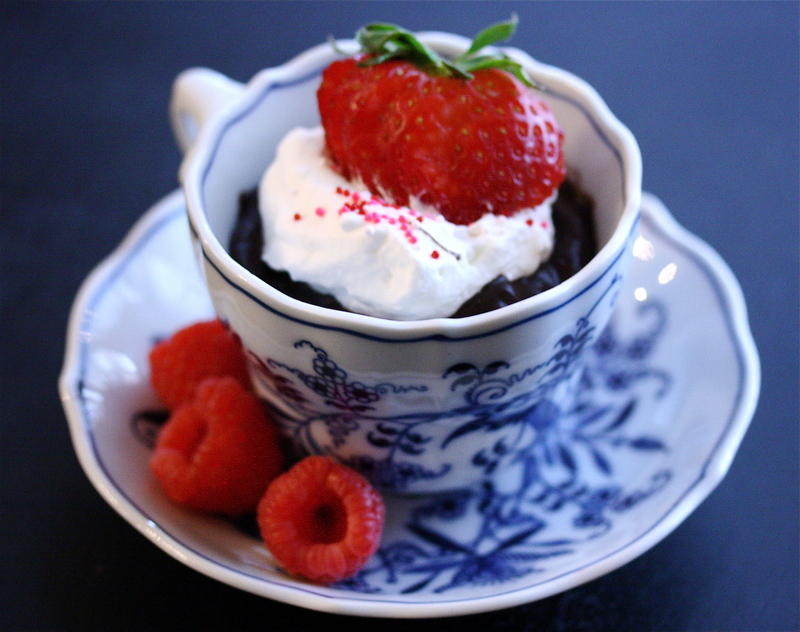 In other words, you can pretty much make this anytime your day needs a little chocolate pick me up. Sounds like a win, win to me! In a saucepan warm up milk, cream and sugar until sugar is dissolved and milk has just started to boil. Meanwhile, mix cocoa, cornstarch and salt in a medium size bowl. 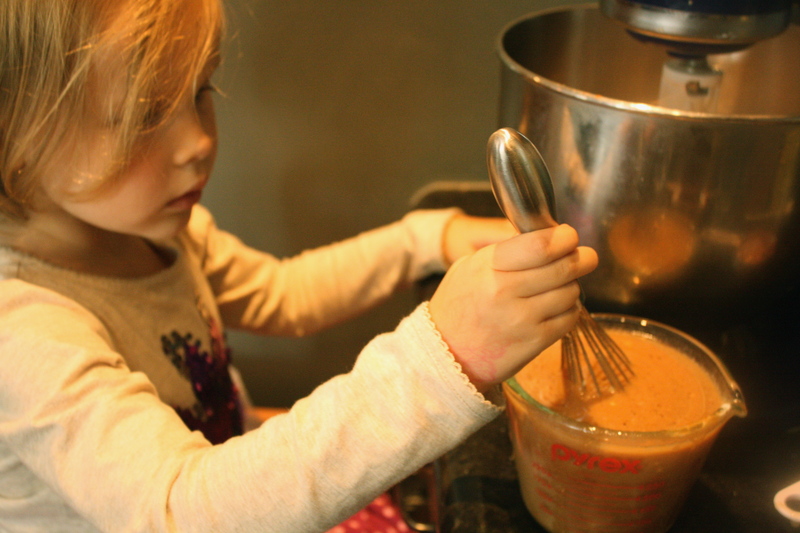 Once the milk mixture is heated, pour half of it into the cocoa mixture and stir with a whisk until combined. 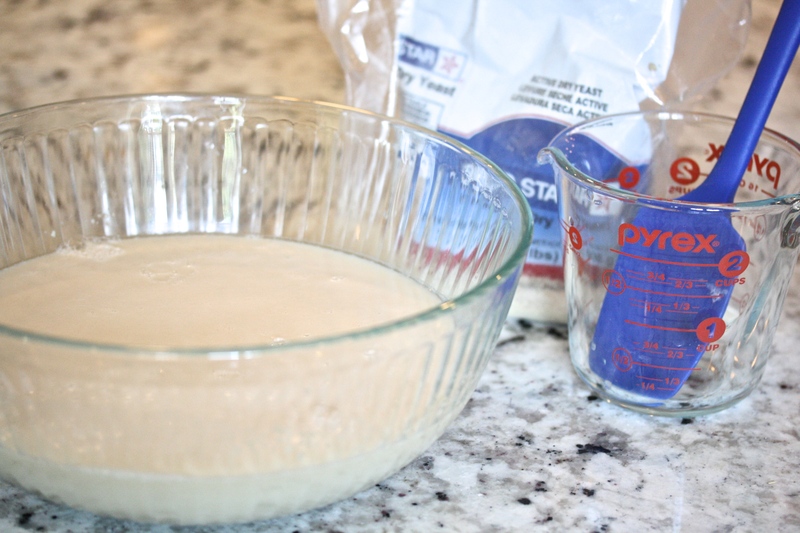 Add this mixture to the remaining milk mixture and whisk quickly to combine. Bring the mixture to a boil and allow to boil for 2-3 minutes until it has thickened slightly. Remove from the heat and stir in butter and vanilla extract. 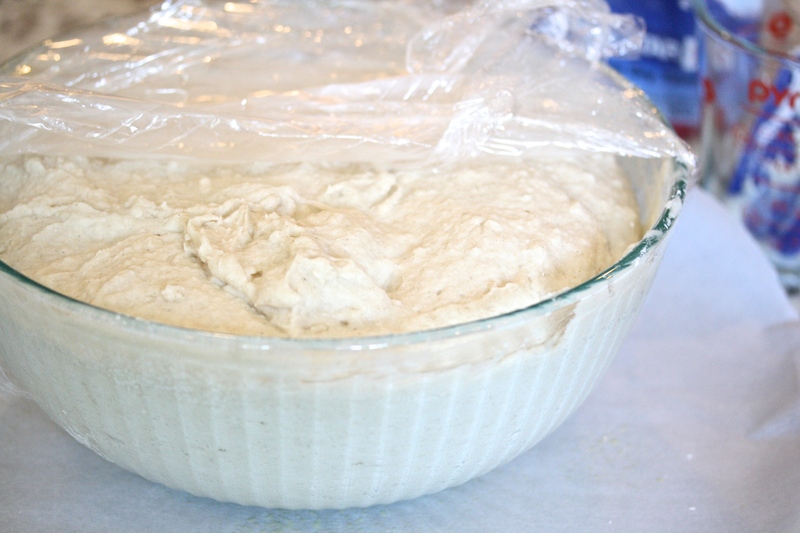 Pour the mixture through a fine mesh sieve and refrigerate for at least three hours. 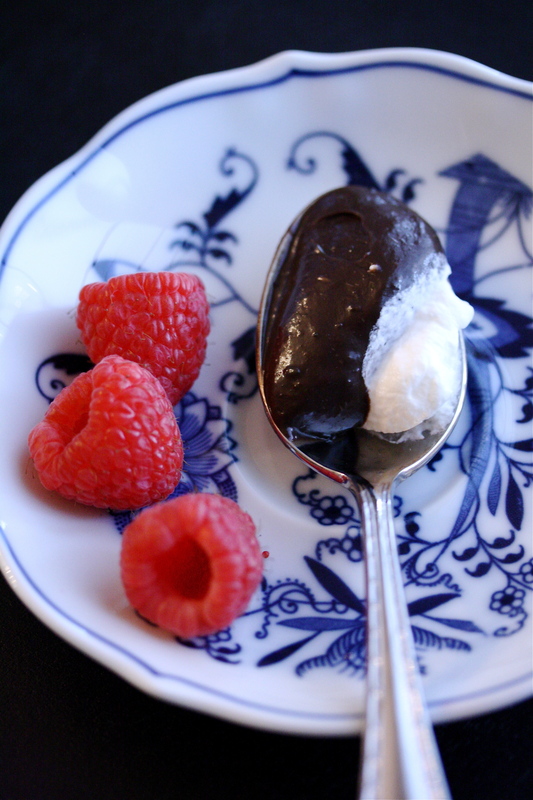 Serve with berries and whipped cream. 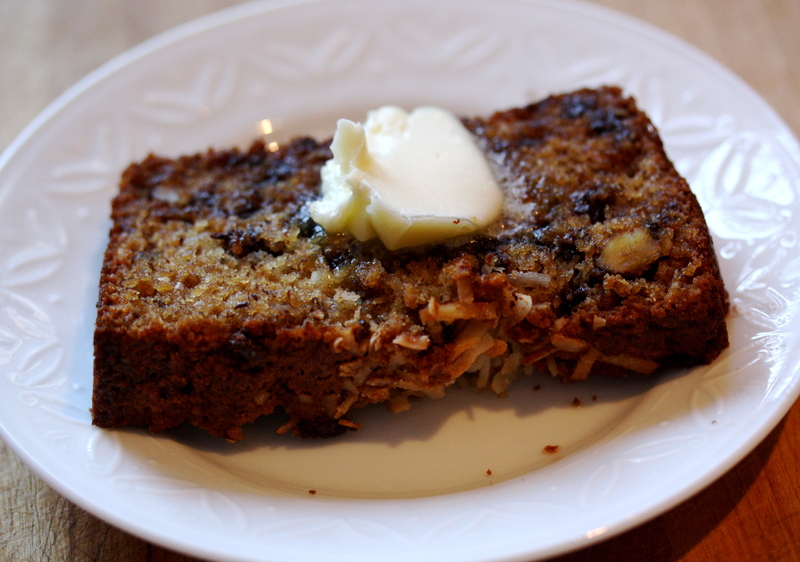 I was perusing some of my fellow foodie blogs recently, and within a week, two of them posted about one of my favorite quick breads: banana bread. However, they didn’t just stop with your plain ole’ banana walnut loaf. They had to go and add coconut, one of my all time favorite foods. I literally went out and bought bananas just so they could get over ripe just so I could make this bread. Hey, I’m pregnant and when the craving strikes, it has to be satisfied. This bread hits all the right notes for me. 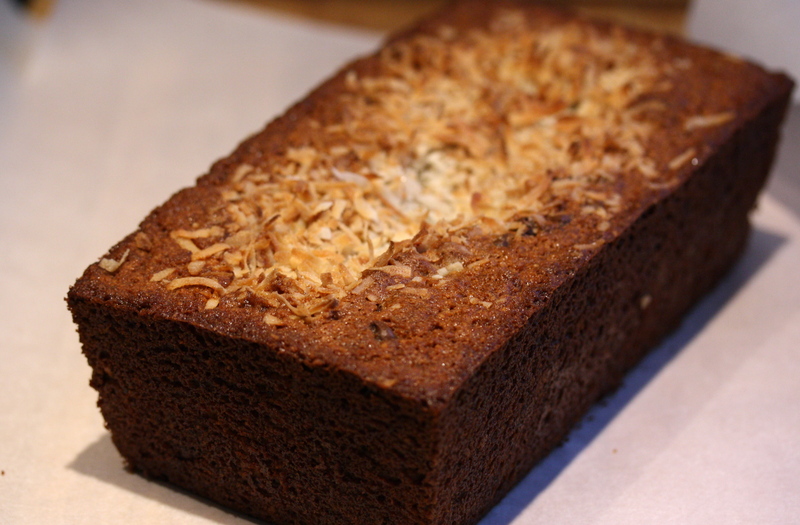 The coconut adds just the right twist to take this traditional loaf to the next level. And, if you really want to get crazy, throw some mini chocolate chips in there. Ugh….I may or may not have consumed the bulk of a loaf within 24 hours. Don’t judge me…. Preheat oven to 350 degrees. 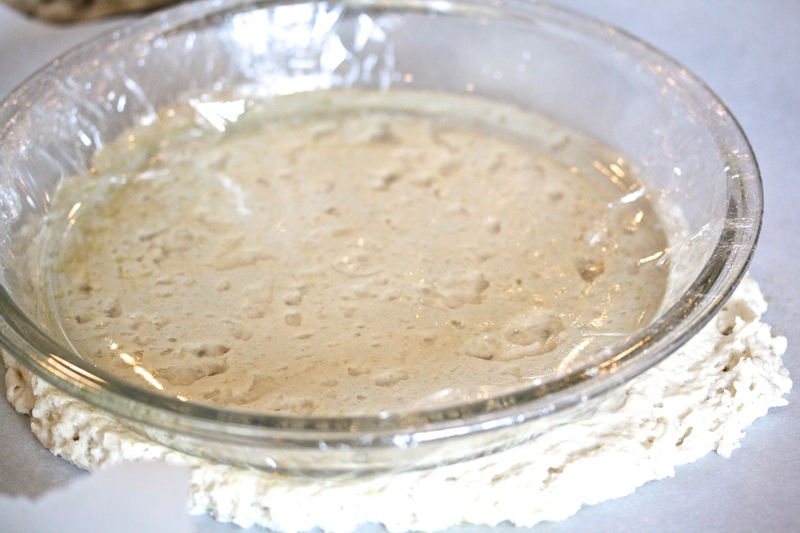 In a large bowl mix together flour, baking soda, baking powder, salt and cinnamon. In another bowl, combine coconut oil, eggs, sugar, bananas, and vanilla. 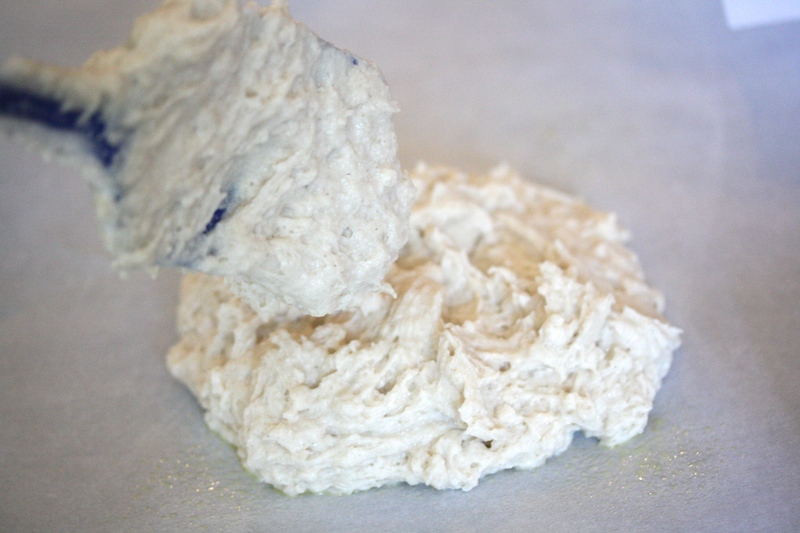 Stir the flour mixture into the wet ingredients until just combined. Fold in shredded coconut, walnuts and chocolate chips. 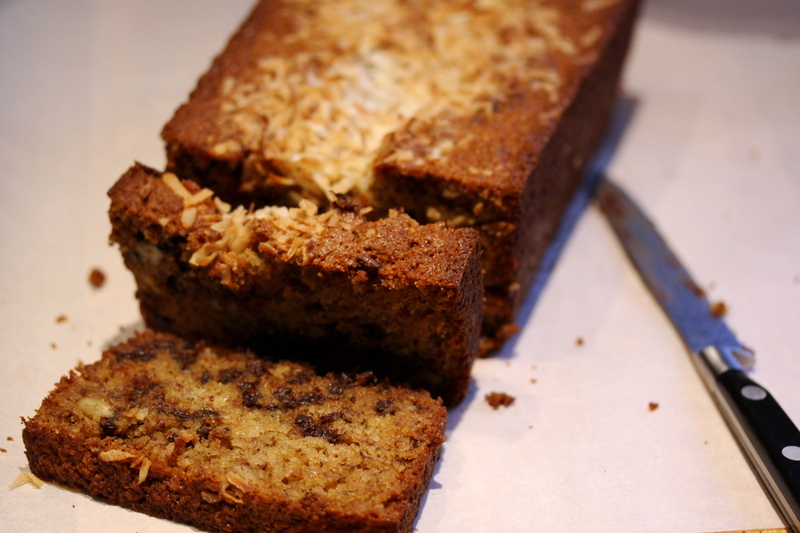 Pour into a greased loaf pan and sprinkle with flaked coconut. 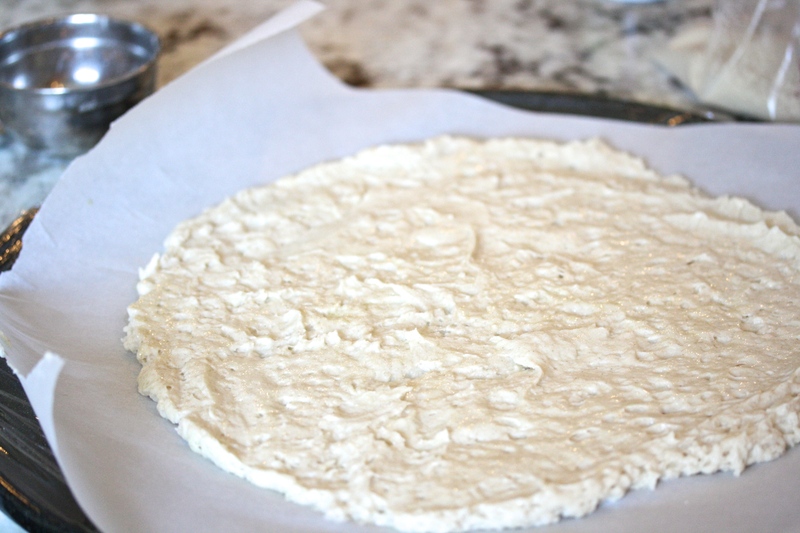 Bake for 50-60 minutes. Serve warm or at at room temperature. Let’s talk Thanksgiving sides, shall we? I like to keep my sides traditional (with the occasional slight update) for the Thanksgiving meal because there is something nostalgic about well loved dishes that bring back memories of time with family and friends. However, I’ve always felt like that old fashioned marshmallow topped sweet potato casserole needed an overhaul. Insipidly sweet and corn syrup laden, the marshmallows almost mask the earthy and wonderful taste of the sweet potato. I think the sugar needs to be dialed back just a few notches! 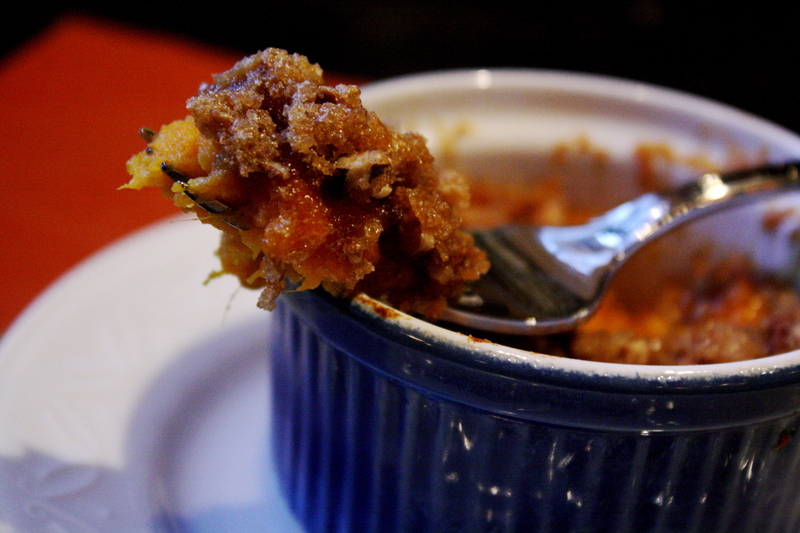 A few years ago, while I was pregnant with my first child, my mother-in-law introduced me to a new-to-me version of sweet potato casserole and I think I ate almost half of it! It’s now a staple on my Thanksgiving table and I hoard the leftovers for myself. I’ve reduced the sugar in the original recipe even more over the years and I love the balance of earthy sweet potato with the nut and brown sugar topping. Pretty sure you should save those marshmallows for hot chocolate. 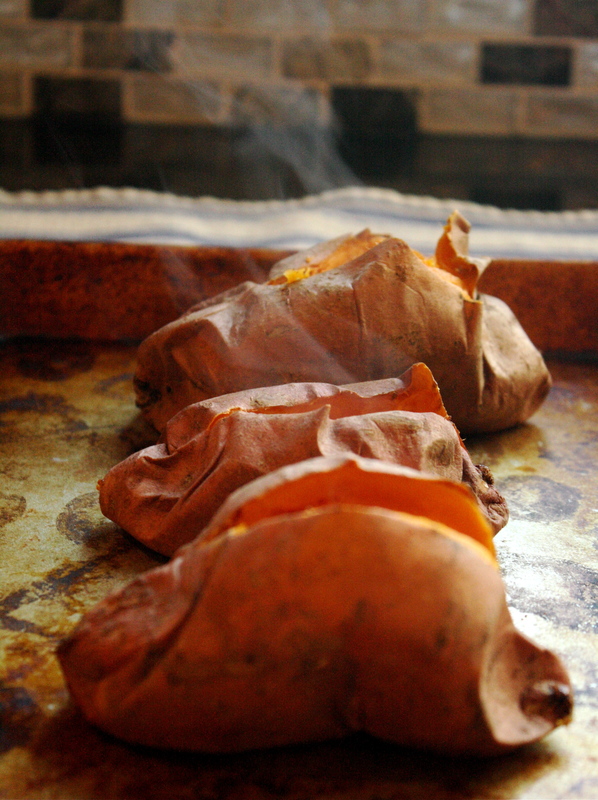 Begin by baking 4-5 large sweet potatoes until soft. You will need about 3 total cups of mashed sweet potatoes. Allow the potatoes to cool slightly. 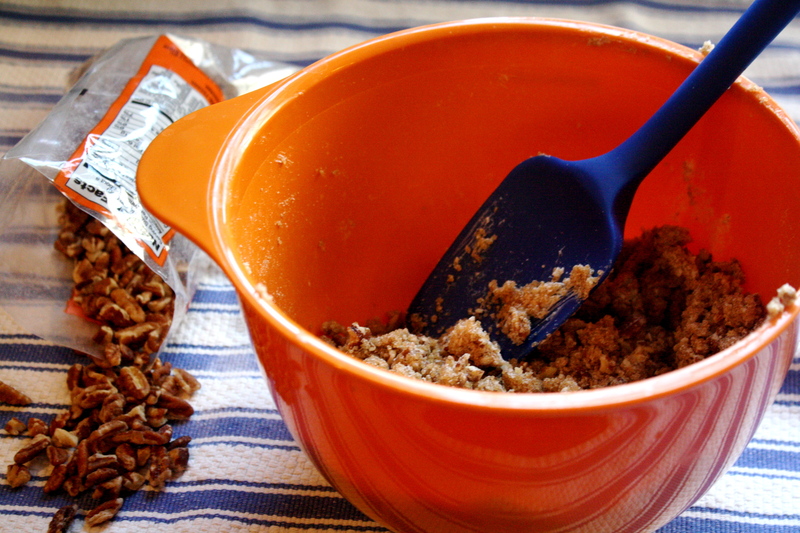 Meanwhile assemble the crumb topping by mixing chopped pecans, flour, brown sugar and butter. Set aside. Mix the cooled sweet potatoes with eggs, vanilla, milk, butter and salt. Whip until light and fluffy and pour into a greased casserole dish. Top with the crumble and bake at 350 degrees for 45 minutes. Preheat the oven to 350 degrees. Bake potatoes for 1 hour or until soft. Cut open the tops and allow to cool. Meanwhile, mix brown sugar, flour, pecans and solid butter until crumbly. Set aside. Place potatoes, white sugar, eggs, vanilla, melted butter and salt in a mixing bowl and mix until combined. Increase mixing speed and whip until light and fluffy. 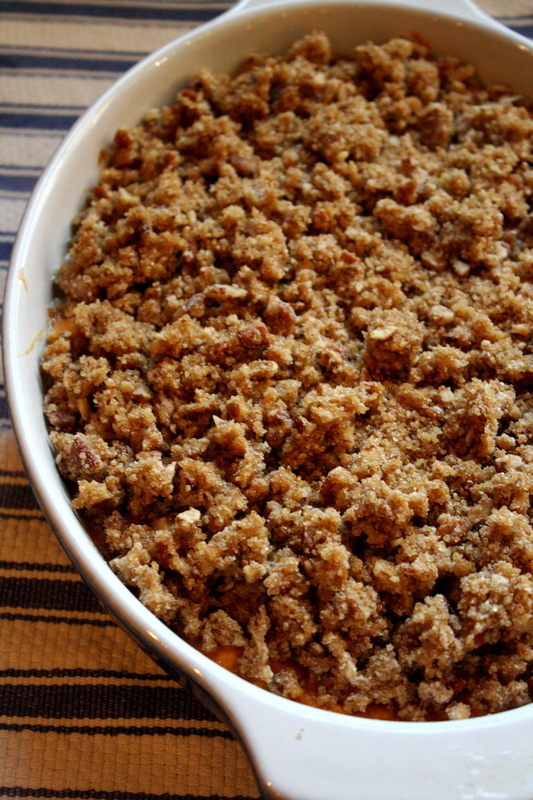 Pour into a greased baking dish and top with the crumb topping. Bake for 45 min until topping is browned. This soup really is something special. I’ve been making it for several years now and Fall just doesn’t seem complete until we’ve shared this meal together. It is warm and spicy, hearty and satisfying, and packs more root veggies into one pot than I’ve seen in any other soup recipe. It is also easily adaptable to be vegan and/or dairy free, making it a diet friendly option for most anyone. This soup easily serves 20 people, so you can make it for a large crowd or freeze part of it for later. 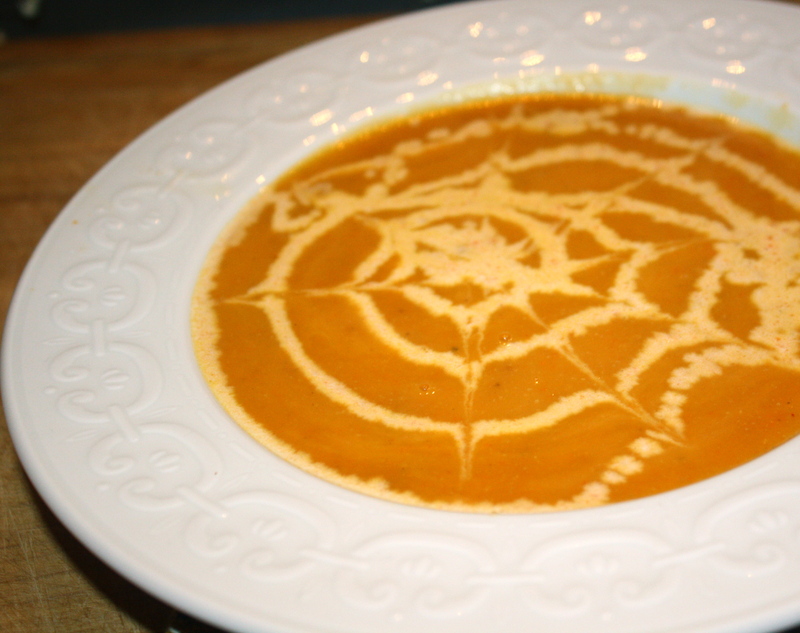 Other than all the chopping, it’s also an easy soup to prepare. I suggest serving it along with a fall salad (may I suggest apples, walnuts and gorgonzola over lettuce) and some crusty bread. Crumble and brown sausage until no longer pink. Set aside and drain of excess fat. Stir in all the vegetables, water, broth and seasonings. Bring the pot to a boil and reduce the heat. Simmer until the vegetables are tender, about 45 minutes. Return 1/4 of the sausage to the pot and use and emersion blender to blend everything together until smooth. Stir in the remaining sausage and half and half. Wow…where have I been the last 12 days? Life just got kind of crazy so to make up for it, I am bringing you something extra delicious. Every fall, my husband and I take our girls to our local farmer’s market and get them a warm apple cider donut. The hubs used to love those things so he has to exercise some serious will power to resist the urge to indulge. So, when I saw a friend post a recipe for homemade baked apple cider donut holes on her blog, I pretty much had to make them. I took a risk and adapted the recipe so that it was gluten free. The result was dangerous…dangerously good. All the donut holes were gone in less than 24 hours and I may or may not have been responsible for downing half of them. Because these donut holes are baked instead of fried, the texture is slightly different than the traditional cider donuts you might find at your local apple orchard. They are tender and moist, almost like a muffin. The taste is hard to beat. Distinctly apple flavored with the spiciness of cinnamon and that traditional sugar, cinnamon coating you expect from a cider donut. I think they are best served warm, but it didn’t stop me from polishing off the last few for breakfast the next morning. Start by mixing your dry ingredients and wet ingredients in separate bowls. I had a little helper with me for this part. Isn’t she the cutest? Add your wet ingredients to the dry ingredients and mix until just combined. 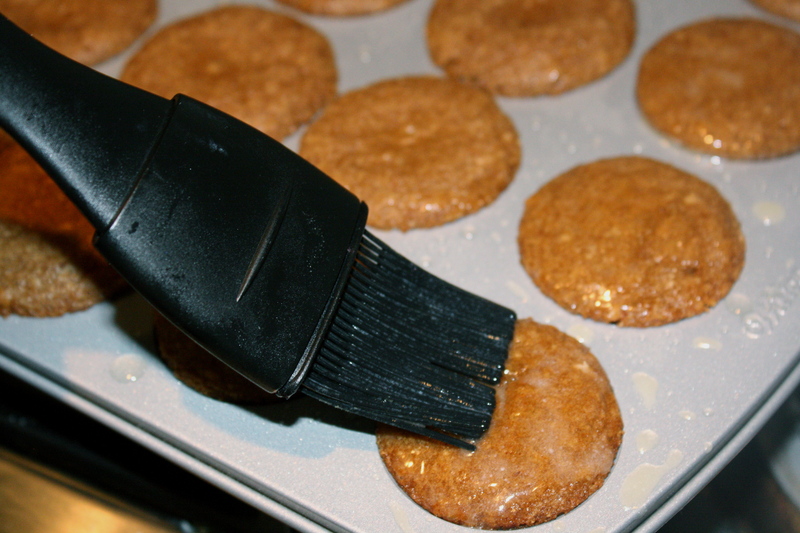 Pour the batter into a well greased mini-muffin tin. Fill each tin to only about 3/4 of the way full so that your donuts don’t rise up and flatten out on top. Please note that I did not heed my own advice. Bake at 400 degrees for 10-12 minutes. 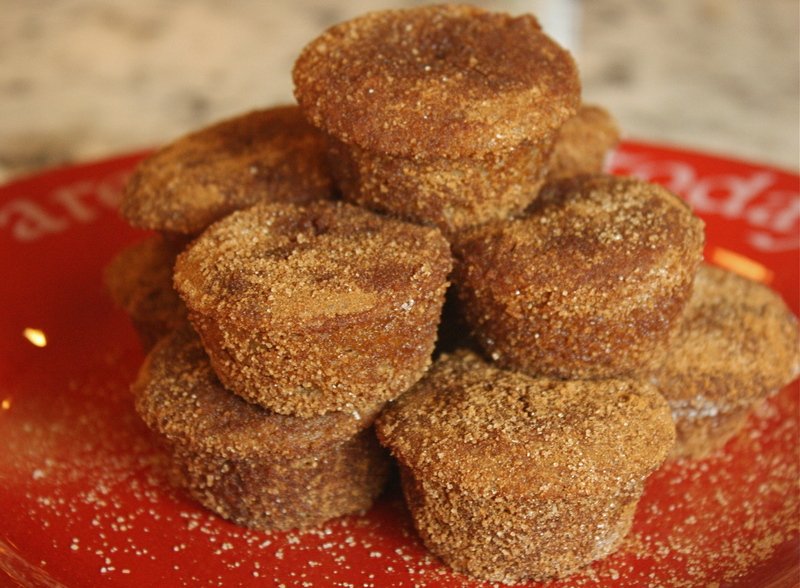 While they are still warm lightly brush the tops with butter and then roll the muffins in a mixture of cinnamon and sugar. Make sure that you have other people around to enjoy these bad boys with you or you might end up eating all of them yourself. Preheat oven to 400 degrees and grease a mini muffin tin. In a large mixing bowl, combine the flour, baking powder, baking soda, salt, and cinnamon. In another large bowl, whisk together the egg, brown sugar, apple butter, vanilla extract, honey, apple cider, yogurt, and canola oil. 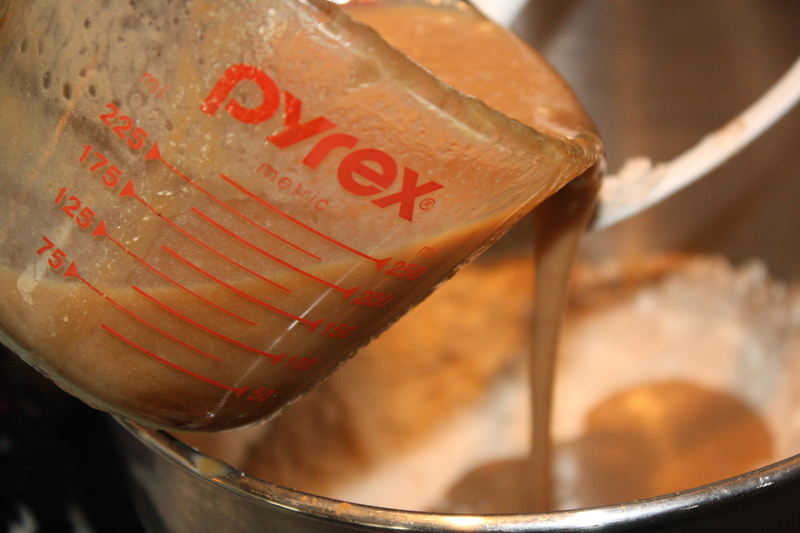 Pour the wet ingredients into the dry ingredient mixture and whisk until just incorporated. 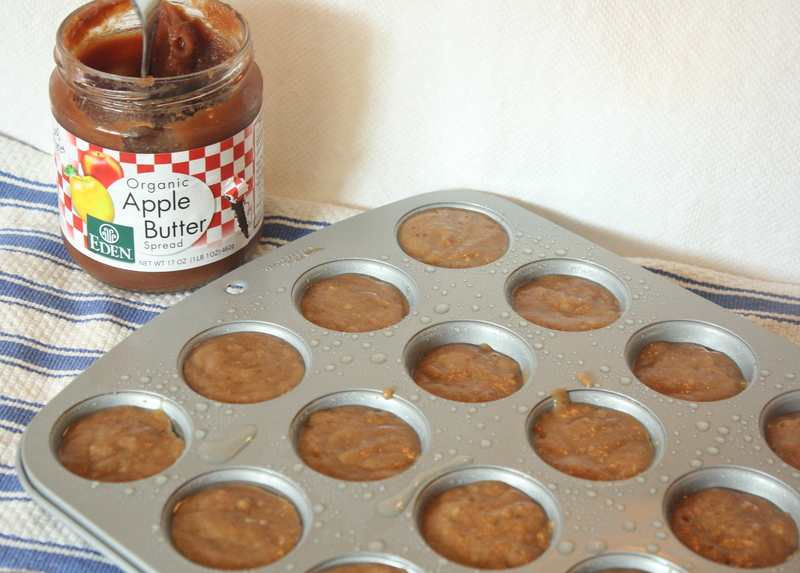 Fill mini muffin pan with the batter; fill each hole only 3/4 of the way. While donut holes are still warm, melt butter in a microwave safe dish. Combine cinnamon and sugar in another dish. Using a pastry brush, very lightly brush a tiny bit of melted butter onto the top of each donut hole, then dip the top of the muffin in the cinnamon sugar mixture. 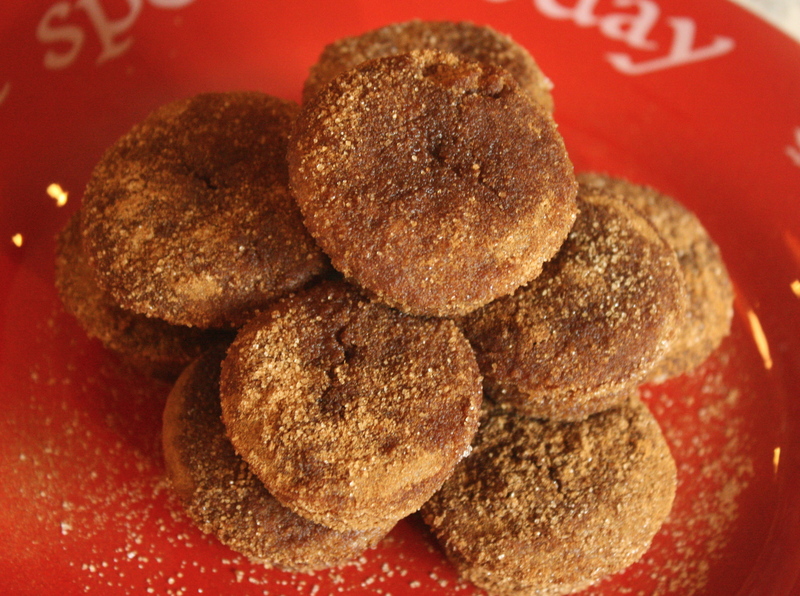 Roll the donut hole in the cinnamon sugar to coat the sides and top. Serve warm or at room temperature. Yep, it’s soup season and I could not be more excited! I’ve had a few soups up my sleeve I’ve been wanting to share with you, but I figured I wouldn’t be inspiring anyone with a warm and toasty soup recipe on a 90 degree day. 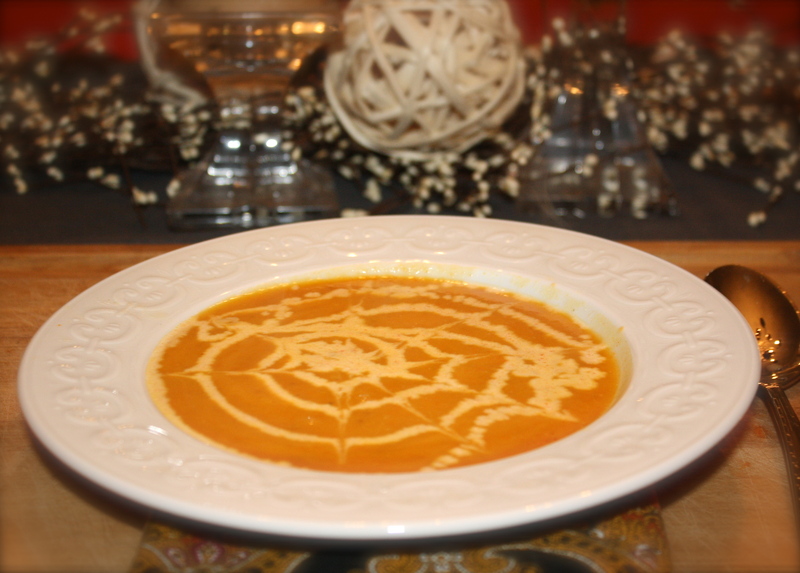 This past week, though, I have busted out a few soups because the nights are cool and there is a crisp, fall sort of feeling in the air. I don’t even need know where to start with the deliciousness of this soup. 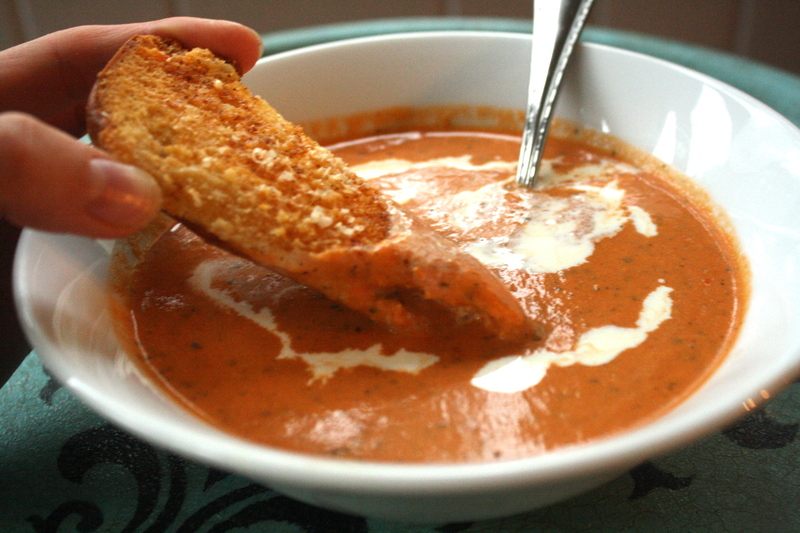 It rivals any tomato basil soup I have ever gotten in a restaurant and is far better than any other tomato soup I have ever made. It hits all those comfort food notes that you want in a tomato soup and yet has a sophistication and depth that makes it fancy enough to serve with a nice meal. What more do I need to say to convince you to make this soup?!?! You will not be disappointed! 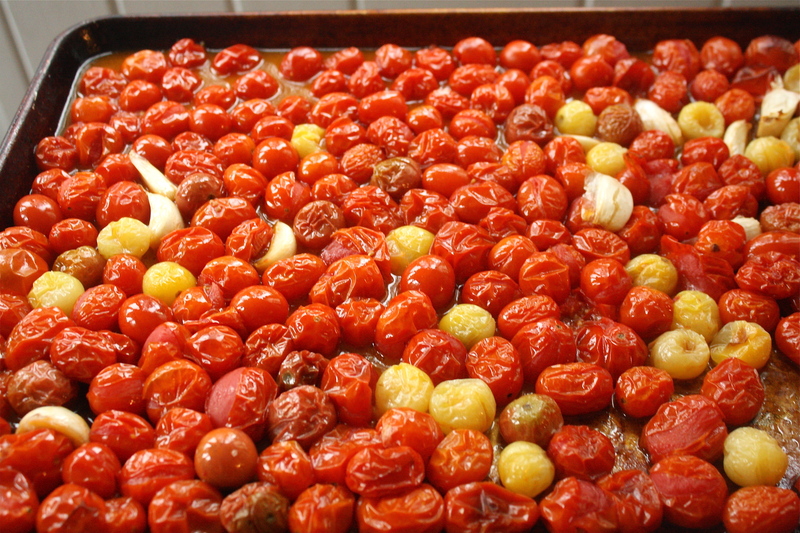 One of the things that makes this soup unique is that you roast the tomatoes with garlic and olive oil before adding them to the soup. By doing this, the tomatoes and the garlic take on a sweet note and a caramelized flavor. You can use any type of tomatoes you want, but I personally like to use a variety. Once the tomatoes have roasted, put them in a pot where you have sauteed some onions. Add chicken broth (or vegetable broth) and a large handful of basil and bring the pot to a boil. Turn the pot to low and simmer for 30 minutes. Preheat oven to 400 degrees. Coat tomatoes and garlic in olive oil and 1 tsp kosher salt and place on a baking sheet. Roast for 30 min. Pull out of the oven to cool slightly. Meanwhile, saute the onions and butter until softened. 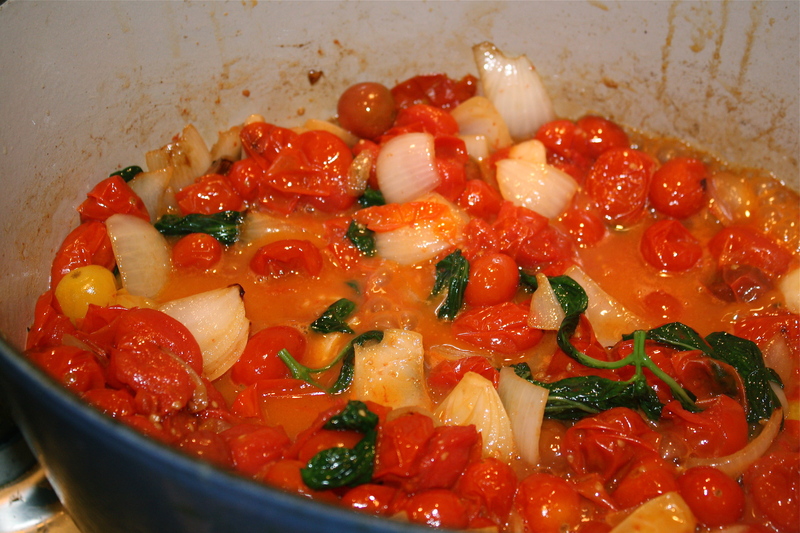 Remove the garlic from the paper and put garlic, tomatoes and all their juices in the pot. Add a large handful of fresh basil and the chicken broth to the pot. Bring to a boil and then lower the temperature to low and simmer for 30 minutes. Use an emersion blender to blend all the ingredients together until smooth. Add 1 cup half and half and salt to taste. Serve warm. Use an emersion blender to blend the soup together and then add a cup of half and half to the soup. 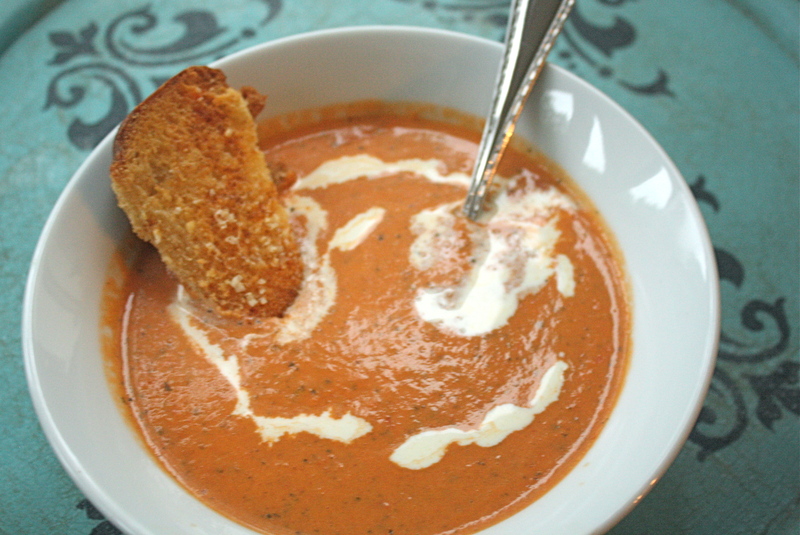 Warm through and serve with grilled cheese or garlic bread.